The message of a text also named as the meaning or sense of a text, represents a semantic concept and idea. The message is stipulated by using words or signs, depending on the language, in a grammar based order to formulate the message. Human which understand the used language understand the message and “store” remember the message, its meaning, the concept behind as well as the wording and the context where the message was related. Humans have a great capability to handle all these factors quickly and precise. In computer science, especially computer linguistic it gets very tuff to reach the same level of complexity and text analytics understanding, very often neural net concepts are used. Using neural net technology addresses the storage and interpretation of the hierarchic relations found in text concepts. Neural net also support the learning aspect. A semantic fingerprint represents the context sensitive semantic, the semiotic meaning of an unstructured or structured text corpus, by generating a semantic hash-code. This approach can be used in computer science especially in the field of semiotic text analytics to store whole concepts and ideas, explained in unstructured or structures text as a semantic fingerprint in form of a virtually weighted mash, stored as semantic hash-code. All words with focus on the bearing words are analyzed for their semantic relations, weighted and transferred into a word cloud structure wherefrom a virtually fingerprint graph forms up. This fingerprint graph is stored as logarithmic hash-code. The concept of the semantic fingerprint is discovering and recognizing the virtually weighted structure of words in each text corpus like a human and builds generalized and weighted data points into a message structure. That structure is instantly transformed into a semantic hash-code. (a kind of logarithmic number). This hash-code is context sensitive. A sentence with the syntax (S1), place text corpus (Ca),has a semantic message, due to the context of corpus (Ca) at location(L1)and Time (T1). A sentence with same syntax (S1),but placed in context (Cb),at location(L1)and Time(T1). may have a total different semantic meaning to 1). A sentence with same syntax (S1),but placed in context (Cb),at location(L2)and Time(T2). may have the same semantic meaning to 1). A sentence with syntax (S2)placed in the text corpus (Ca)at location(L1)and Time(T1). may have the same semantic meaning to 1). A sentence with same syntax (S2),but placed in context (Ca),at location(L2)and Time(T2). may have a total different semantic meaning to 1). The semantic meaning of a text paragraph not only is formed by the intrinsic semantic of the paragraph itself, the meaning is also influence from the bigger context the paragraph stands in. The meaning (message) of a paragraph is built on a cascade from smaller context to bigger context. Semantic is a triangle between: Syntax; Semantic; Pragmatic. The semiotic tradition explores the study of signs and symbols as a significant part of communications as part of linguistics. The words in each text are not accidentally placed the way they are, they are placed according to the generative grammar, rules of the used language. The theory of generative grammar, especially of naturally evolved languages, that considers grammar to be a system of rules that generate exactly those combinations of words which form grammatical sentences in a given language. Modern talking means; all words build a cloud wherefrom human will recognize a message and meaning, if human understand the concept of grammar in that language. 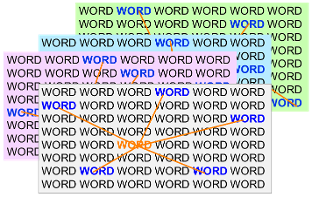 The right positioning of words in a text corpus builds a virtually weighted structure from where message and meaning, the intrinsic semantic, is understood. The meaning and message of a text is built by the bearing words which are forming the intrinsic semantic message of a text. These words can be viewed as weighted and related data points. The message of a text (meaning) is formed by placing the right words into the right order in a text corpus. The rules based on these words are placed are found in the grammar of the language type used to create the text message. The intrinsic semantic is the message generatively formed by placing words in a text corpus using correct language grammar. We are not talking about the individually interpretation of that message, we are talking about the message inherently formed by the placing of the words, as of no one would look at the text. The theory of generative grammar, especially of naturally evolved languages, that considers grammar to be a system of rules that generate exactly those combinations of words which form grammatical sentences in a given language. Modern talking means; all words build a cloud wherefrom human will recognize a message and meaning, if human understand the concept of grammar in that language. The bearing words are converted into data-points in binary level to form and generate a generalized concept pattern. The meaning and message of a text is built by the bearing words which are forming the semantic message of a text. This information also remains, if the bearing words are viewed in binary code level. As a fact, by viewing the text corpus in binary level, understanding the weighted data point of the bearing words. The semantic fingerprint visualized in form of a network cloud of weighted bearing words, turned into data points. The semantic hash-code, a transformation of the network cloud with weighted data points into a logarithmic number. There is a further potential to enhance the hash-code into a smart machine. By adding on further codes the hash-code not only contains the complex message, he also contains the action commands if the matching with other codes have a certain result. So, the hash-code turns into a “function” or a smart machine. Sometimes concepts are known by other names in everyday language such as "kinds", "types" or "sorts", as in "Chamomile is a kind of tee", or "A SUV is a kind of a car". 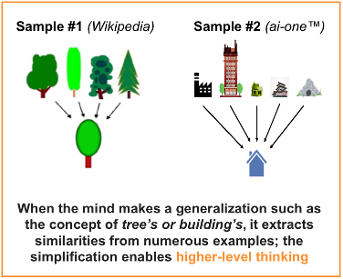 Generalizations and higher-level thinking are the key for humans for superior and complex decision making. Innovation, creativity, science, research and development, the questioning about the next and unknown, all finds its motivation in the fact that our brain always thinks in higher-level. Like a flywheel, the brain tries to connect, understand and explore all data and information we receive and store. Understand concepts means generalizing the gathered knowledge and trying to apply it in other occasions or situations for solution solving in any kind of life circumstances. The concept of the semantic fingerprint is reducing the challenge of handling semantic concepts and messages to get communication between machines and men-Machines simpler and faster. With the generative semantic hash-code, containing neutralized message concepts, the barriers between languages can be overcome very simply. By adding on further codes the hash-code not only contains the complex message, he also contains the action commands if the matching with other codes have a certain result. So, the hash-code turns into a “function” or a smart machine. Companies like ai-one™, BrainDocs™, are offering various solutions, based on the analyst-toolbox, the ai-one™ Technology, based on the semantic fingerprint and hash-code.